If you watch “House of Cards,” “Orange Is the New Black” or any other video via Netflix — and your Internet Service Provider (ISP) is Verizon’s FiOS broadband network — the streaming speed will be getting faster. But how much faster? A 50 percent increase within the next month isn’t a bad guess, if Netflix’s recent deal with Comcast is any indication. Netflix and Verizon reached a deal Monday on a “paid peering agreement,” whereby Netflix will pay Verizon an undisclosed amount to boost the streaming speed for its customers. How can we measure Netflix’s streaming speed? Through its USA ISP Speed Index. Netflix collects data on the average speed at which Verizon, Comcast and other ISPs stream its content at peak times. The deal is similar to one Netflix made with Comcast in February. As a result, in March, their joint customers saw their streaming speed jump nearly 50 percent — from 1.68 to 2.50 megabits per second (Mbps). Verizon FiOS currently streams Netflix content at 1.91 Mbps, but if it rises as much as Comcast’s did, it will increase to 2.84 Mbps. That would make it the second fastest of the 16 large ISPs Netflix tracks, behind Cablevision-Optimum. 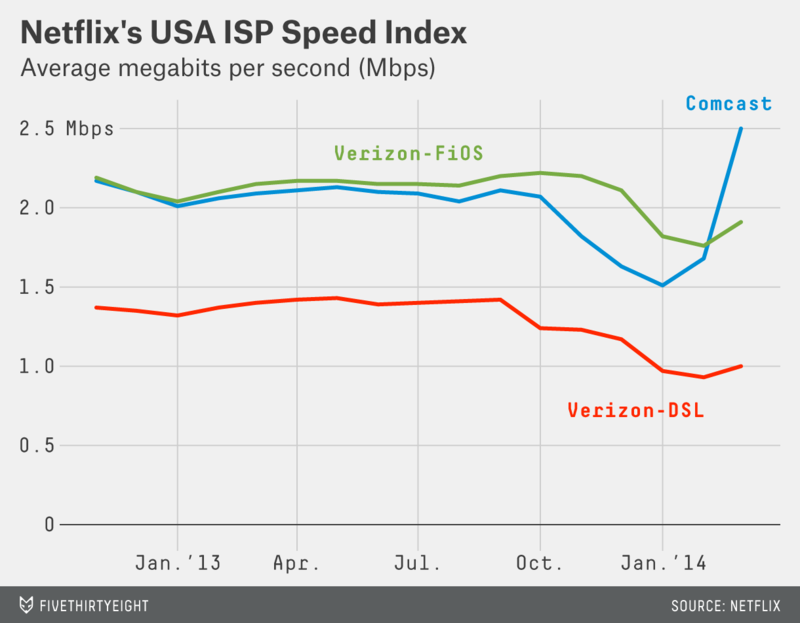 A note, though: This week’s deal doesn’t appear to apply to Verizon’s slower DSL service.